Apirana Taylor is from the Ngati Porou, Te Whanau a Apanui, and Ngati Ruanui tribes, and also Pakeha heritage. He is a prolific poet, playwright, novelist, short story writer, story teller, actor, painter, and musician. 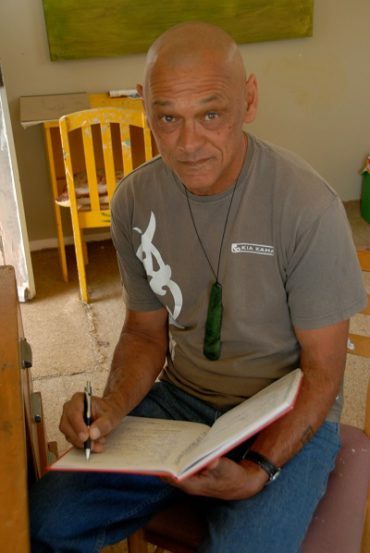 His poems and short stories are frequently studied in schools at NCEA and tertiary level. His poetry and prose has been published nationally and internationally and translated into several languages. He has also written for radio and television. Apirana’s latest book of poetry, The Breathing Tree, was published by Canterbury University Press in 2014. His new novel, Five Strings, will be launched by Anahera Press during the Auckland Writers Festival in May 2017. Apirana has been Writer-in-Residence at Massey and Canterbury Universities, Rangi Ruru, St Andrews College and Hagley High School. He has been invited several times to India and Europe to read his poetry and tell his stories, and to national and international festivals, the most recent in Medillen, Colombia (2012). He travels to schools, libraries, tertiary institutions and prisons throughout New Zealand to read his poetry, tell his stories, and take creative writing workshops. meditative, haka and haiku ….